The UAE-based startup presently enables the UAE domestic help segment gain access to financial services, learn new skills and more. According to Migrant-Rights.org, a GCC-based advocacy organization advancing migrant rights, more than 750,000 domestic workers work in the UAE. This segment is the current focus of fintech startup Rise, which aims to “democratize access to essential financial services," such as financial identification, credit, insurance and investments, with the goal of further catering their services to the high number of low-income migrants across the GCC. The UAE-based startup presently enables the UAE domestic help segment gain access to a bank account (through a partnership with United Arab Bank), assist remittance transactions (through a partnership with UAE Exchange), and will soon be launching insurance and investments in partnerships with global firms in both space. Padmini Gupta, co-founder and CEO of Rise, got started on this venture after a personal experience: in 2015, after the Nepal earthquake struck in 2015, the Gupta family’s domestic helper asked for a large loan to help rebuild her family’s home. Though she had been living in the UAE for 15 years, she had no savings or credit to enable her to rebuild her home, as the common practice among low-income workers was to send all their earned income back home. “This made me realize that the financial sector is failing to cater to a large part of our population, especially to those that need it the most,” says Gupta. She noted that though the country (and region at large) offered a fast-growing market, it wasn’t as inclusive as it could be, especially for the most marginalized. “I started Rise to democratize access to essential financial services for low-income migrants, so that they can build a better financial future back home,” she says. “Being unbanked or under banked leaves millions of migrants open to exploitation by loan sharks and employers as well as unprotected to deal with life events or able to plan their retirement… If you are an expat in the UAE, you would probably have multiple companies call seeking to help you manage your wealth, open offshore accounts for you, give you loans or even help you plan your retirement and return home. Nobody was providing these services for low income migrants- now, we do." Armed with her background in banking (her experience involves spearheading inclusion for banks in California in the United States), Gupta went about building up Rise with co-founder and Chief Product Officer Milind Singh (who’s also Gupta’s husband), whose two-decade long career has seen him working at Openware and advising internet giants like Google and Facebook on emerging market strategies. The core team also features CTO Mandeep Singh, who’s a serial entrepreneur with multiple exits in the payments tech space, and Head of Growth Rahul Lakhaney, a serial entrepreneur turned growth hacker, who advises several startups in the region on growth hacking. Incorporated in August 2016, Rise launched its beta in June 2017, which focused on their growth platform, and then launched its financial services arm in December 2017. At its core, Gupta explains that Rise uses tech and AI to acquire and service low-income customers, “at a fraction of the cost currently experienced by legacy financial institutions, allowing them to extend their financial services and grow profitably.” The platform uses a proprietary AI chatbot to engage with customers in a conversational format on various topics, from financial literacy, to planning and opening accounts. As most migrants in the UAE use Facebook, WhatsApp, or IMO as tools to stay in touch with families, Gupta asserts that their customers are familiar with their AI bot’s chat interfaces, though they’re also in the early stages of experimenting towards voice-powered AI to cater to people who prefer using voice as the primary communication medium, rather than text. The startup has partnered with United Arab Bank to give their customers a salary account, which comes with a VISA debit card and can be used internationally. “We undertake the acquisition and servicing while the funds sit with United Arab Bank, and are protected by UAE deposit protection schemes,” explains Gupta. Besides that, Rise also has a partnership with UAE Exchange to send money back to customers’ home countries too, and are working on bringing in-app remittances as well. Beyond financial services, Rise offers a range of learning, certificating and career management tools to help customers grow under their “Learn with Rise, Grow with Rise, Save with Rise” concept. 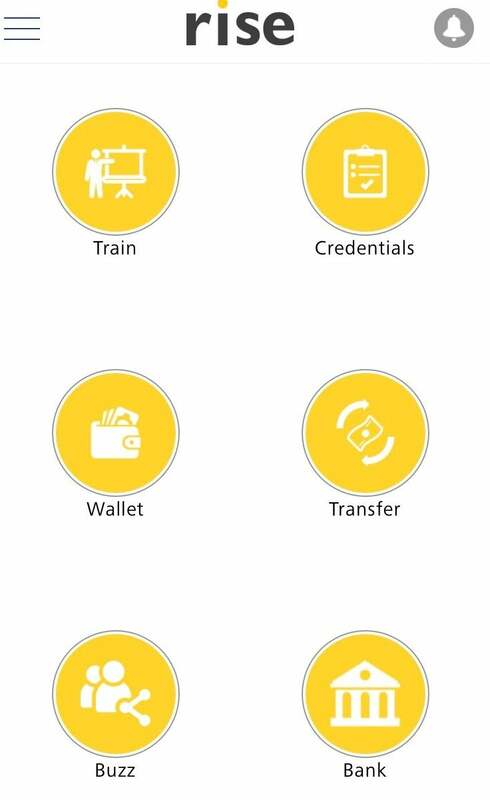 The platform offers learning opportunities through its range of courses from child development to nutrition tips from experts, to becoming better child care providers and earn more, plus free workshops from industry leaders to upskills if they decide to switch career paths, and workshops on financial literacy to enable customers to plan ahead and insure savings. The Rise team also runs a Facebook group called “Mary Poppins in the UAE” to help domestic help workers to find their next jobs without paying any agency fees. With an impressive onboarding process (Gupta says their fastest record was getting the process of opening a bank account done end-to-end in 57 seconds), she explains that since its launch, the Rise platform has been growing at 70% month-on-month, while the chatbot has handled more than 2.5 million messages, and is currently serving more than 20,000 unique users a week. For its business model, Gupta lists out three revenue sources: “end user subscription fee based on freemium model, revenue share with providers on our platform, and underwriting financial risk on new bespoke products designed for low-income migrants.” The startup has also received funding from London-based hedge fund Astra Amco, and are currently raising for its Series A round. As for challenges they’ve faced growing the business, Gupta says the biggest has been building trust in the brand, as it involves the users’ salaries and financial future. “Building trust is an ongoing process,” says Gupta, adding that so far, the positive word-of-mouth from existing customers have helped in establishing their brand, especially with a quick visit on their Facebook page which showcases the service they provide to customers. But with similar players in the market, how does the platform stand out? “Rise is more than your financial partner,” Gupta notes, as it also offers tools and resources to help their customers grow. What drives you forward as an entrepreneur? What are your top tips for launching a business? As a leader, what do you ensure you do for your company to run efficiently?